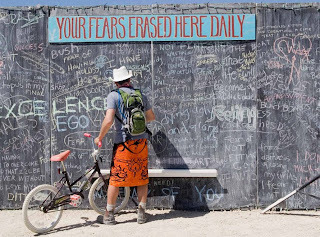 COME JOIN US FOR ART AND BIKES! 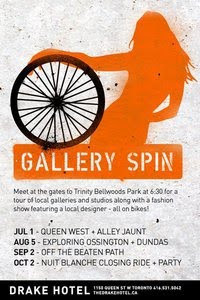 Tomorrow we are hosting the first Gallery Spin of the summer!! Come and enjoy bikes and art together at last!! 69 Vintage Collective will be at The Drake for a post-spin Pop-Up shop in the lounge! Marilyn from Rozaneh, Lost and Found, Stacked, Tomorrow Never Knows and Ransack the Universe will be there with their best accessories! Have you ever been so super-awesomely surprised by something that you almost fell off your chair? Yeah? Well I bet it was not even HALF as awesome as the surprise I got this weekend when Namtron showed up unexpectedly in New York for the Bicycle Film Festival... I was so TOTALLY floored when I realized that the two shiny, seafoam arms hugging me on Friday night were attached to Namtrons head that I screamed as loud as I could for about a full minute. And so there were 6 Nightshades on the loose in NYC this weekend which means that we have about a zillion funny stories involving The Coyote Ugly, Sombreros, All-Night bike rides through Central Park and (see above) pink limosines! Stay tuned for amazing bike videos, pics and interviews from the NYC BFF - I promise it will make Gossip Girl look as lame as watching the grass grow. Hey! I'm exhibiting at the bicycle film fest's art show JOYRIDE in New York! b) the entire festival is so ridiculously fabulous.... so you should probably come to everything. but especially this! The Nightshades are cleaning out their closets!!! Please bring a minimum of 5 items to swap. Items must be in good condition. Spring is here and we've found some awesome stuff that we're looking to swap! Books, fabric, clothes - you name it, we've got it. From piles of party dresses to fabulous fabric and all kinds of crafty goodies - you're sure to find something you have to have! You're welcome to come and have a look this Saturday between 1-5pm, in the garden at 69 Vintage Collective. Please bring a minimum of 5 items to swap. Items can be clothing, books, craft supplies or furniture. Please don't bring anything ripped (unless it's supposed to be) or in bad shape. Alterations will be available in The Make Den, downstairs!!! Cover is only $5~ and will help us send Laura's art to NYC for the Bicycle Film Festival! 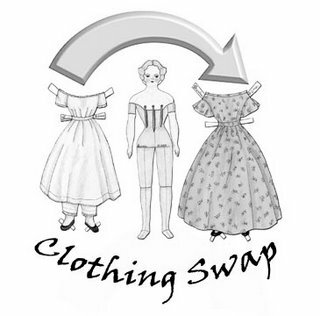 It's been a long time since we've held a swap, and we've got a tonne of great scores - don't miss out on this one!!! EQUALS THE BEST BIRTHDAY EVER! It seems like every year my birthdays get better and better... maybe it's the great people, maybe it's the Bambino.... but I just wanted to thanks everyone for coming out and making it GREAT! If you would like to participate in this spectacular annual event, it happens on May 23rd, somewhere near a body of water... I suggest following the bikes! DIY Divas and Home-Ec Honeys! Ever wanted to hem your own dresses? Skinny your flares and bubble your skirts?! 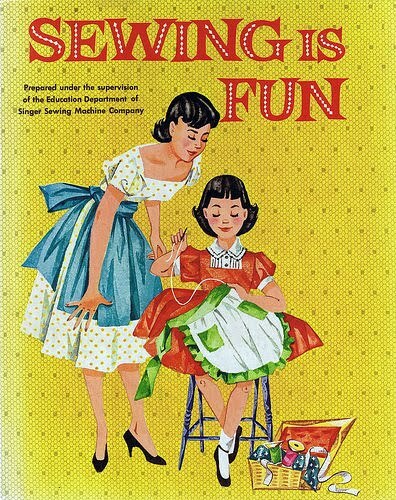 This is your chance to brush up where mom left off with a 6 week beginner sewing class! Start off with the basics (hems, elastic, gathers and more!) and then move on to a simple bag or pillow case. Once you've mastered the basics, it's time to make a summer dress or romper! Classes start this Sunday June 6th, and run 12-3pm! Email irenestickney at hotmail.com to register! ...but get used to it. Cat and Kirsten are becoming Mormons. PSYCHE! 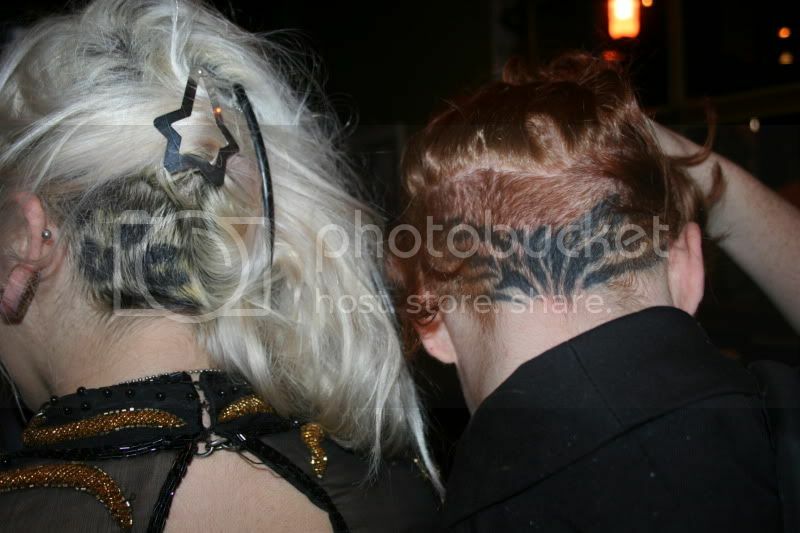 Okay so that last picture isn't from the fashion show - but don't you love Megans hair??! ?